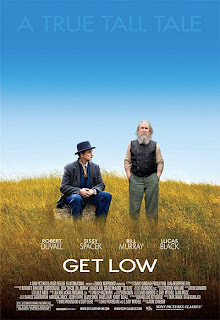 While the concept of having a funeral party for a man who is not yet dead may be just the right hook one needs to get an audience interested in their film, that is not really what "Get Low" is about. What we are really watching here is a sweet yet very sad story about redemption and regret. The entire film hinges on the history of its central character, Felix Bush. As played by Robert Duvall, Felix is a man who has hid from the world trying most likely not to forget what happened to him and what he had done, but instead trying to live and deal with it the best he knew how. Maybe the only way he knew how. "Get Low" is a southern myth type story and it is a fine film, one that certainly deserved more attention from the award season and one that is to be applauded for not playing to any of the major trends that are a constant in mainstream films at the moment. With three incredibly strong performances from veteran actors and an even more surprising quiet yet strong supporting show from Lucas Black, each of these elements elevates an already interesting story and allows the pitch perfect tone of the film to remain from beginning to end, not letting the audience go. First time director Aaron Schneider captures the beautiful landscapes and barren colors of the old south, making the entire film look like an old photograph from that time period. There is just something about period pieces that are set in the south that attract me. I find no matter the story, the context in itself is so interesting I am drawn to them. This not only made me find "Get Low" extremely touching and a tad odd, but the idea of an old hermit coming to terms with the fact his life will soon to be over and the overwhelming sense of regret that won't let him go peacefully is just extremely powerful. The film is a quick hour and forty minutes, but as I said earlier it hinges on the mysterious history of Duvall's Felix and it is in this I found the only slight disappointment with the film. we watch and wait to see what is the reason for everything Felix has been orchestrating, we wonder what could move a man to cut himself off from th world for so long and even though we feel the pain and understand his heartache as Duvall delivers his final speech at his own funeral party, we, or at least I, couldn't help but wonder if that's all there was to the story. Yes, it is no doubt a tragedy and caused ever-lasting regret to plague his life, but it just doesn't feel as strong as it should have. The execution by Duvall is just right and the set-up is more than it deserved. It didn't make me like the movie any less, I still think it is a gorgeous movie and a very moving story, but after everything we go through with Felix, it simply feels as if we come up a little empty-handed. I hate to speak a bad word of this film though because it does do so much right. From Duvall's amazing showmanship as Felix to the excellent Bill Murray that allows this film to flow flawlessly back from drama to comedy. Murray in fact nearly steals the film away from our main character, but Duvall inhabits this guy so well, it is hard to take your eyes off him. The two working together is a dream and when I say the award season missed out on this one I think Murray deserved a best supporting nom just as much as anyone else. And then we have Sissy Spacek, who brings such a pleasant aura it is as if she came straight out of the time period in which this is based. She lends such an elegant hand to an otherwise tangled tale. She brings light to the darkness of Bush's past and she shows him hope, she gives him reason to do what it has taken him thirty something years to build up the courage for. This is truly a great film, one I wish I would have seen before its DVD release, but this deserves more than a rental, it deserves to be passed on. The acting is great and the film is beautifully made, but I just couldn't help feeling that the story could've been better.